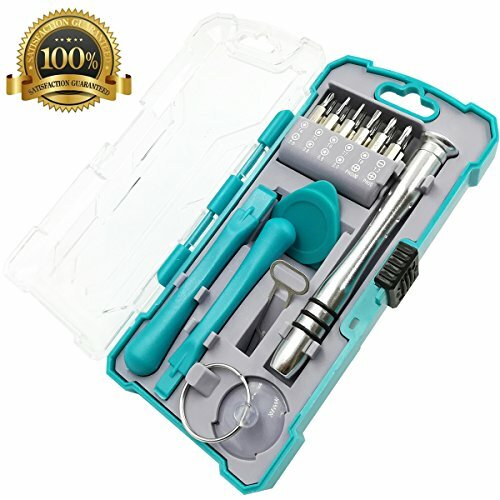 18 in 1 precision screwdriver set is a multi-function repair tool kit and is is designed to service popular iPhone, iPad, Macbook, Computer, Laptops, Phones, Game Consoles, Camera, Watches, Glasses and other precision electronic equipment. All bits are made of CR-V steel, which is high hardness, good toughness, strength and durable. And all of bit is through strict quality testing. The ergonomic design screwdriver handle with non-slip texture and silicone rings is for added comfort. The ultimate high-performance bit kit including all essential tools is great for every DIY lover, fixer, hobbyist, and handyman. This is a set of tools you can trust, will not let you down. 1 x Triangle Spudger: Great for prying open the trickiest enclosures scratch-free. [Perfect design]: Exquisite suitable portable box, Screwdriver handle with ergonomic design non-slip texture, and Screwdriver tips with strong magnetic can easily absorb screws and won't slide off even shake it slightly. [Top Quality]: Ratchet screwdriver handle with 3 Anti-slip silicone ring. Chrome-vanadium steel magnetic tips hard heated treatment finished. Includes Phillips bit, Slotted bit, Pentable bit, Hex bit, Torx bit, Tri-point bit. [Package Include]: 18 Pieces Screwdriver set repair tool kits include a ratchet screwdriver handle, 12 screwdriver bits, 2 Opening Pry Bars, Triangle plectrum, SIM card ejector pin, LCD Suction Cup and a luxury Portable box. [Wide application]: Ideal of fixing tools for repairing iPhone/ Android Smarll Phone/ iPad/ iPod/ PSP/ XBox/ Play Station/ Nintendo/ SSD/ Computers/ MacBook/ Laptops/ Camera/ Watch/ Toys and other electronic device. [Great Gift]: This Screwdriver set with a exquisite portable box, easy to carry and use. is also as a delicate and decent gift to friends, families and other people who are professional or amateur in the electronic world. If you have any questions about this product by Lerom, contact us by completing and submitting the form below. If you are looking for a specif part number, please include it with your message.